Combining Office 365 with VoIP phone services gives South Florida businesses Microsoft technologies and applications in one efficient cloud based product focused on enhanced communication between employees and clients. Access, share, and edit business critical documents, emails, and calendars in real time across your desktop, laptop, cell phones, and mobile devices. Communicate through instant message or in voice/video conference while presenting documents. Integrating Office 365 technology into your business opens up a whole new world of technology you may not even know exists! Office 365 offers security to your business as a 24/7 work environment for your employees to use at home, in the office, and on the go. Improve productivity and enjoy instant access to company resources and collaboration from anywhere. Visit the Office 365 site for an overview of all the amazing things Office 365 has to offer. Integrating Office 365 and VoIP allows your business to take advantage of all the Office 365 tools in combination with the latest in Microsoft communication technologies, providing a constant and secure flow of collaboration at work, on the go, or at home for all employees. Gives employees access to the right information faster, easier, and from any device. 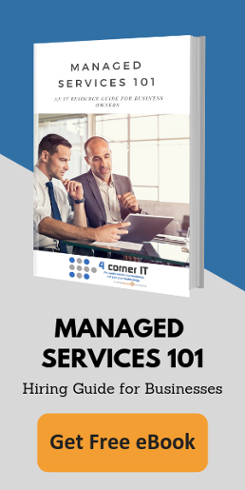 As Microsoft Cloud Champions, 4 Corner IT offers Office 365 and Office 365 VoIP solutions for South Florida businesses, in and around Fort Lauderdale and the Miami area, and in New York in Manhattan and throughout Long Island. Get on board with progressive organizations and start collaborating in a way that allows you to make informed decisions anywhere at any time.